In Austin, Texas, the capital of the second most populous and second largest state in the U.S., there is a young industrial welder who spends his day building overhead bridge cranes and designing custom parts for oil production. It wasn’t long ago, however, that he made like fellow Texans and spent time on a football field. There are over 450,000 welders in the U.S. and their average age is 55 years old. This young man is well below the average at 20 years old, but he’s been learning the trade since the age of 14. He is known around parts of Texas, or anywhere he’s been, really, as Gunner Tatum. “It was always an interest in the back of my mind,” Tatum said. “Who sculpts metal together? There’s not many people, so I wanted to be the guy that does something that other people don’t get to do. Gunner isn’t a nickname or a pet name, and he doesn’t know why his parents gave it to him. It was just a little over a year ago that Tatum confused Montrealers with his name as a member of the Concordia Stingers football team, playing a sport he had taken up in the third grade. Tatum was recruited out of Crane High School where he spent time as a star middle linebacker, and an equally talented running back. In his final year of high school, Tatum rushed for over 2000 yards and 18 touchdowns. The 20-year-old’s intention at the start of the Stingers training camp was to play as linebacker, until Stingers coaches notified him about the possibility of him playing both positions, and eventually, only the running back position. “When we came to training that year, we realized that we needed more bodies at the running back position, and that’s when we put him there,” recalled Stingers head coach Mickey Donovan. Tatum was already being put to work in his first regular season game. The running back carried the ball 35 times—he tied a conference record for carries that day—for 192 rushing yards and a touchdown, and it propelled the team to a 25-15 win over the Bishop’s Gaiters, their first win in two seasons. “It happened so fast,” said Tatum. “I was so nervous playing that game. It just kind of felt like everybody was out to get me. I just remember it being so fast-paced with only two downs and then you punt. As fast as the victory came to Tatum, however, so did the end of his season, and collegiate career. The Friday night lights shone on a cold, yet vibrant Concordia Stadium that night. 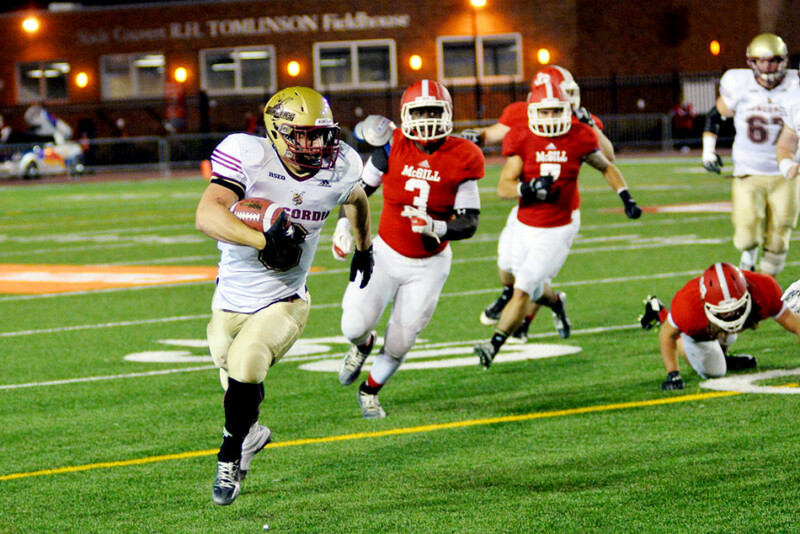 It was a homecoming game for the Concordia Stingers as they faced the Sherbrooke Vert et Or. The Stingers were playing their third game of the season and had a chance to go 3-0 for the first time since 2006. It was a first and 10 for the Concordia Stingers at the Sherbrooke 42-yard line, and quarterback Francois Dessureault found Gunner Tatum with a pass early in the second quarter. “I remember it just like a colouring book, the same pages coloured a hundred times,” said Tatum. “I remember. Just like that same commercial that comes on every single day, you remember every single part of it. It was on this play that Tatum took a hit to the head from Sherbrooke’s Alexandre Gagné and suffered a concussion. Tatum dropped the ball and the Vert et Or recovered it and turned it over. He laid on the ground for five minutes while being tended to by medical staff, before walking off the field on his own. Post-game, coach Donovan wasn’t happy about the hit, but he acknowledged it was a “football play.” That same football play ended Tatum’s game and, ultimately, his season. “If that play would have never happened I could have still been playing for Concordia right now,” Tatum said. It wasn’t the first time he had suffered a concussion, but it also wasn’t the only injury that plagued him. The running back had a nagging right shoulder injury that had been following him since his high school days. It was an injury he had kept to himself for years—only his dad and a few of his teammates knew. Following his concussion, he went home to Texas for welding, before returning to Concordia during the winter that followed the 2014 season. More disaster struck for Tatum as he re-injured his shoulder in a winter training practice session with the team. “I heard the crack and it felt the same way it did when I tore it up my senior year,” he said. “It just came to a point where the pain [outweighed] my motivation. The injury kept Tatum awake at night as he rolled over in his sleep, writhing in pain, and he sometimes cracked his shoulder out of place. After consulting family, friends and his teammates, Tatum returned home following the winter camp and found a full-time welding job, forgoing his studies in Sociology, and his hopes of becoming a cop. He cited how law enforcement officers were treated, and seen as “the enemy,” as one of the reasons why he stopped. Ultimately, college, at this time, isn’t for him, because it may never have the same feel as that year at Concordia. He is grateful for the experience and maturity he gained during his time in Canada.